There are plenty of reasons to celebrate the revival of Detroit. A city that once saw its street lights shut off has become a model of urban renewal. But there is a downside—notably a surge in traffic that in decades past would have led to the gridlock that commonly paralyzes other major urban areas. Yet, rush hours in Detroit are moving a little smoother than expected. An expanding grid of “smart intersections” that are designed to measure the flow of traffic and adjust the timing of traffic lights keep things moving. Less than an hour west of Detroit, the city of Ann Arbor has set up an even more elaborate high-tech grid, called a “vehicle-to-infrastructure” system. It constantly communicates with nearly 3,000 vehicles operated by local residents and commercial drivers as they move through the city. A pilot program, all participants have volunteered, crafted by the University of Michigan Transportation Research Institute, or UMTRI, can track traffic flow, monitor road conditions and alert drivers to problems along their routes. “A smart city is an urban area that uses different types of electronic data collection sensors to supply information which is used to manage assets and resources efficiently,” explained author Matt Hamblen, in a ComputerWorld magazine article. As smart city technology evolves, it will start to affect almost every aspect of a resident’s life—most notably by increasing their transportation options. Using a network of sensors, smartphones and WiFi, a key goal for smart city planners is to smooth out traffic flow while seamlessly integrating several modes of transportation. For a commuter that might mean using a single smart phone app that allows them to hail a ride-sharing vehicle, or get on a train bound for downtown, then hop on an on-demand micro-shuttle that will drops them off at their office. Finding a parking spot will be easy: just tap a button on your car’s instrument panel and it will automatically find a spot close to the destination, park on its own and pay electronically. And a new generation of battery-car owners won’t have to worry about running out of juice. Their smart city infrastructure will tell them where to charge up, while billing their credit card automatically. Ford has been a pioneer in transportation ever since founder Henry Ford came up with the idea of an affordable automobile for the masses, the original Model T. Building on that pioneering heritage to help solve today’s transportation challenges, the company is relying on its traditional manufacturing expertise to help it become a leader in mobility. Several years ago, the company set up an outpost in Silicon Valley to focus on projects such as the development of autonomous vehicles. Its efforts have been ranked as one of the industry’s most advanced by Navigant Research, and Ford last year announced it will take the giant step towards commercialization early in the next decade by producing fully driverless vehicles for ride-sharing and delivery fleets. Initially, Chariot will run its 14-passenger, WiFi-enabled and air conditioned vehicles on four routes in London. These routes were designed based on a detailed analysis of areas that are currently harder to reach with current public transport, with the aim of helping people get through the first and last legs of their commutes. Chariot is not a replacement for public transport, but rather complements the city’s existing services by helping people access them more easily. In 2016, Ford purchased San Francisco-based Chariot, an on-demand micro-shuttle service. Chariot fills the gaps in existing public transportation routes in underserved neighborhoods and is already operating in a number of cities, including its home base in the Bay Area, as well as New York City and Austin, Texas. It recently expanded abroad to London. “Over the next five to 10 years, we’ll see significant growth in the use of ride-sharing,” said Ford’s Robinson. Indeed, in a study released last December the Boston Consulting Group estimated that by 2030 fully 25% of the miles that Americans clock on the road will rely on ride-sharing services. Other studies have suggested that percentage could run as high as 90% or more in dense urban areas where owning a vehicle can be costly. Ride-sharing is already gaining ground in a number of cities, such as New York, where recent studies have found services like Lyft, in which Ford is a major investor, already rival traditional taxis in terms of the number of daily rides. In the future such services could help cut air pollution, reduce energy consumption and make better use of existing roadways. But, for now, some recent studies have indicated that ride-sharing services have increased congestion in cities like Boston. Part of the challenge, the research indicates, is a lack of integration between different modes of public and private transportation. That’s one of the issues Ford plans to address as part of its new partnership with Autonomic, a Silicon Valley-based tech company. 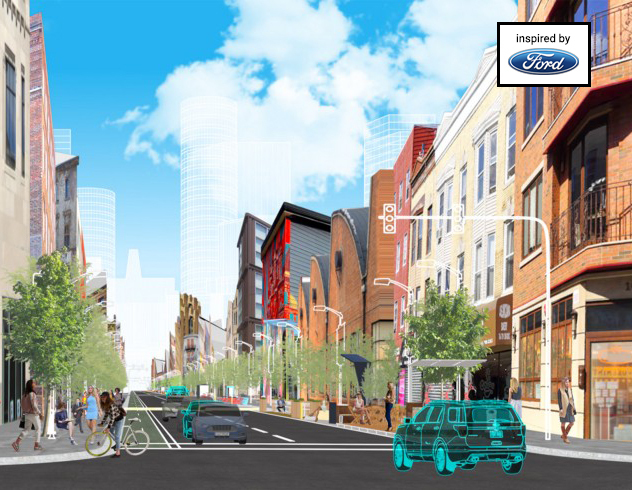 The goal is to develop a cloud-based platform that can handle a city-wide high-tech ecosystem, according to a recent article written jointly by Rich Strader, Ford’s vice president for Mobility Product Solutions, and Autonomic CEO Sunny Madra. The development of smart cities has just begun to gain traction, but the The IDC Smart Cities competition underscores the pace at which the transformation is taking place. Seventy U.S. cities entered the competition. Detroit and Ann Arbor are two of the 26 cities and 34 projects that IDC has chosen as finalists in 14 separate categories. Ann Arbor is squaring off with Arlington, Texas and Las Vegas in a category that targets connected and autonomous vehicles, as well as ride-sharing. Detroit, meanwhile, is competing against Boston and Kansas City in another category focused on infrastructure. These communities are on the cutting edge of a transportation revolution that will allow residents – as well as commuters and tourists – to travel quickly, safely and easily. Smart Cities will become more accessible places to live and work. Businesses will be able to provide goods and services more efficiently. And Ford is betting it can play an essential role in that transformation. Next StoryWhat’s Next for the West Riverfront Park?